RU Ready for the 4th of July? The 4th of July is coming up, and that means celebration! A lot of people like to partake in pool-parties and BBQ’s. Unfortunately none of the humans ever invite me to their pools, so my friends and I have to improvise by splashing in the water trough! 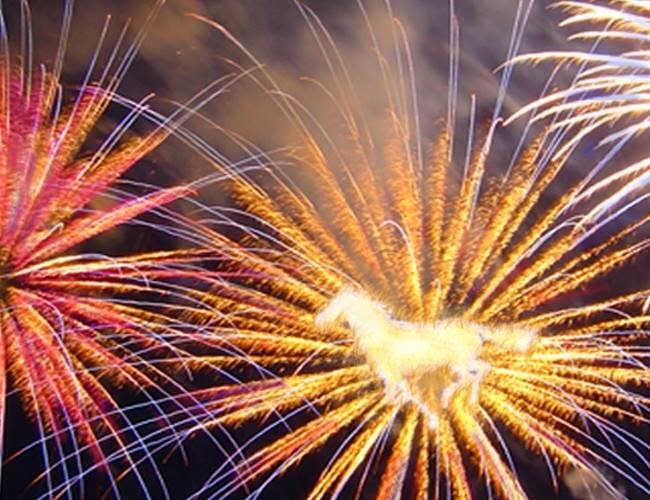 The humans like to end the day with fireworks, which are fairly infamous in the equine community. Fireworks tend to trigger our “fight or flight” response, otherwise known as our sympathetic nervous system. This is when epinephrine (adrenaline) is released from the adrenal medulla and prepares our body to flee from the perceived attack of the deafening fireworks thunder and blinding flashes of lights. 1. Use a fireworks desensitization CD. This is an option to consider prior to fireworks season. You can play the CD starting at a low level, and slowly increase the volume daily until the horses in the barn become comfortable with the noise. In fact, my friends at the College of Veterinary Medicine at the University of Florida performed a study that analyzed the effects of loud aircraft noises on the behavior and stress levels of pregnant mares. Stress was analyzed with blood cortisol and cardiac function, and blood concentrations of the hormone progesterone monitored pregnancy. The highest anxiety, movement, heart rate, and cortisol levels exhibited by the mares were reported on the first day of exposure. After the first day, all signs of stress decreased by the second day. Throughout the study, progesterone concentrations were within normal ranges, and all of the mares delivered live and normal foals without assistance. Researchers attribute the decreased signs of stress to the horses being confined in familiar stalls, which helped them quickly acclimate to the loud noises. Our stalls and turnouts are our homes, and we feel comfortable in these areas! As we acclimate to the fireworks CD, let us adjust to the noises and do not take us out of our comfort zone! 2. Provide your horse with distractions. This includes hay and salt blocks to keep him busy. Do not be alarmed if your horse does not want to eat. However, take precaution with toys or other objects. Safety is a priority, and you would not want to have any dangerous objects that could be in your horse’s way or have the potential to inflict injury. 3. Ensure that the barn is well ventilated. This allows the “burning” smell associated with fireworks to continue to move, and most importantly, leave the barn. 4. Remain calm because you are your horse’s reassurance factor. They look to you for support, and feed off of your reactions. 5. If your horse has a history of suffering from anxiety during fireworks season, reach out your veterinarian for medical assistance. Your vet will be able to prescribe anti-anxiety medications such as clomipramine (Clomicalm) or Fluoxetine (Prozac) to aid in alleviating any uncontrollable stress. Sometimes, veterinarians will prescribe sedative drugs such as acepromazine, xylazine, and romfidine. Don’t forget, your human safety is just as important as ours! We need you to take care of us, so do not risk getting injured to reassure us. Within time, the fireworks display will be over, and we will be safe for another year! Make sure to enjoy a hot dog on me! Summer and Sweet Itch, just some of the things that BUG me!